FRAMINGHAM – A year after a number of high-profile automated vehicle incidents, American attitudes toward fully self-driving cars have not rebounded. AAA’s annual automated vehicle survey found that 71 percent of people are afraid to ride in fully self-driving vehicles – indicating that overall sentiment has not yet returned to what it was prior to these incidents occurring (63 percent). Experience seems to play a key role in impacting how drivers feel about automated vehicle technology. Many cars on the road today are equipped with advanced driver assistance systems (ADAS), which are considered the building blocks for fully self-driving vehicles. AAA’s recent survey revealed that regular interaction with ADAS components like lane keeping assistance, adaptive cruise control, automatic emergency braking and self-parking significantly improves consumer comfort level. On average, drivers who have one of these four ADAS technologies are about 68 percent more likely to trust these features than drivers who don’t have them. Even more promising, AAA found that Americans are receptive to the idea of automated vehicle technology in more limited applications. About half (53 percent) are comfortable with low-speed, short distance forms of transportation like people movers found at airports or theme parks while 44 percent are comfortable with fully self-driving vehicles for delivery of food or packages. However, once the passengers become more personal – in particular, transporting their loved ones – one in five remain comfortable. Currently, more than half of Americans (55 percent) think that by 2029, most cars will have the ability to drive themselves, however, this timeline may be overly optimistic given the number of vehicles already on the road today. Those who are skeptical that fully self-driving cars will arrive that soon, cite reasons such as lack of trust, not wanting to give up driving, the technology won’t be ready and that road conditions will not be good enough to support the technology. While experts agree that a fully self-driving fleet is still decades away, it is likely that more highly automated vehicles will be on the roads in the coming years. 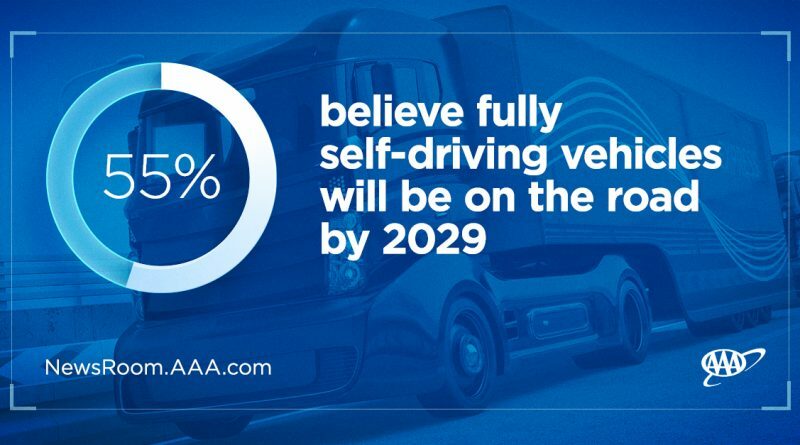 The more drivers understand both the benefits and limitations of the technology that is currently available, AAA believes the more prepared and receptive they will be for the experience of riding in a fully automated vehicle when the time comes. To help educate consumers on the effectiveness of emerging vehicle technologies, AAA is committed to conducting ongoing, unbiased testing of automated vehicle technologies as well as researching how related emerging technologies can help reduce or prevent crashes. Previous research includes ADAS technology naming, testing of driver support systems and the annual automated vehicle survey (2016, 2017, January 2018 and April 2018). AAA Northeast is a not-for-profit auto club with 66 offices in Rhode Island, Massachusetts, Connecticut, New Jersey, New Hampshire and New York, providing more than 5.7 million local AAA members with travel, insurance, finance, and auto-related services. AAA has an office in Framingham.